Teeth discoloration resulting from drinking coffee, tea, cola and red wine; or from smoking, and the aging process is one of the most common reasons affecting teeth aesthetic value. But with the advancement of technology in the field of cosmetic dentistry, solution to this problem has been easier than ever before with the different whitening system available. The treatment begins with a thorough examination of patient’s teeth and gums, as well as talk about oral hygiene & habits to determine if teeth whitening procedure would benefit the patient. This will also help our dentist determine the best whitening solution for the patient. Teeth whitening procedure is also a necessary procedure if patient is planning on getting other cosmetic dental procedures, such as veneers or composite bonding or after the removal of dental braces to evenly match the color of teeth. Additionally, there are many factors that can affect the shade change of teeth after whitening, so it’s important to have realistic expectations before and after whitening. Depending on factors like current shade and staining, it may take longer to get that bright, white smile. You should also know there are certain foods, habits (like smoking), and medications that can cause staining to occur after your teeth have been whitened. You’ll want to avoid these as much as possible during whitening in order to maintain your white smile. Maintaining strict oral hygiene (brushing and flossing) regimen is key to prevent stains from reforming, and routine professional teeth cleaning are highly recommended. Teeth sensitivity is normal after treatment because of teeth enamel dehydration, but the intensity of sensitivity to any of the system vary depending on the condition of a patient’s teeth prior to treatment. Some teeth are more sensitive than others. Sensitivity wears off within few hours but some experience it even after 2 weeks. Using anti-sensitivity toothpaste prior to getting teeth whitening procedure also helps. 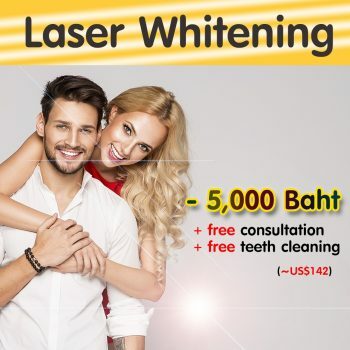 Doctor Smile Laser whitening system is one of the most popular sought after treatment at Pattaya Smile Dental Clinic. It is safe, effective and easy solution to whiten teeth. It effectively removes even stubborn stains from years of using teeth-staining products like coffee, tobacco, wine and other pigmented stains performed by our highly trained staff. The Laser Teeth Whitening procedure begins by removing plaque from the teeth and then the LWS peroxide-based gel is applied on the teeth’s surface. Once the LWS is applied to the teeth surface, the laser is used to activate the gel and initiate the whitening process. Laser activation accelerates the whitening process, making it pleasantly safe, effective and easy way in achieving brighter and whiter teeth. 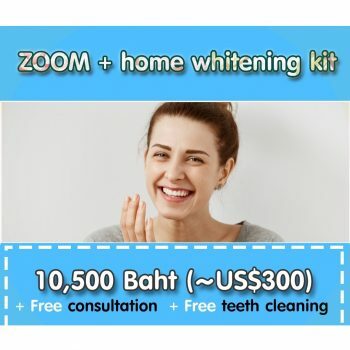 Zoom whitening is the leading choice all around the world in solving teeth’s unsightly discoloration because compared to other whitening systems; ZOOM has a brighter white effect that lasts longer and with less fade back. 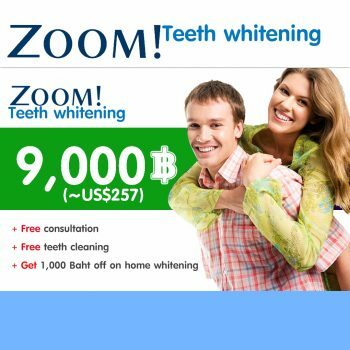 ZOOM whitening uses an Advanced Power Chairside Lamp to activate the whitening solution. The procedure begins by covering the lips and gums, leaving the teeth exposed, after which ZOOM hydrogen peroxide whitening gel is applied, which works together with the Zoom light to penetrate the teeth and break up the stains and discoloration. The gel remains in place for 15 minutes while the light is activated. As the hydrogen peroxide is broken down, oxygen enters the enamel and dentin to bleach the stained substances, leaving the structure of the tooth unchanged. 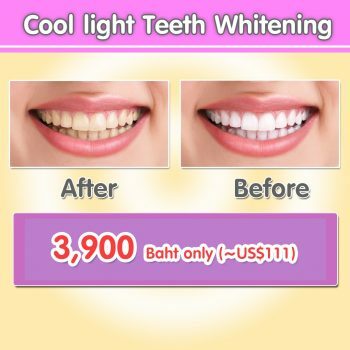 Cool light whitening system whitens teeth safely and effectively, and whitening effect could last for 2 years. The treatment is done using LED-Cool Light, emitting laser impulse along a curved line following the natural curve of teeth to reach each tooth thoroughly and whitens teeth evenly. Cool Light whitening procedure takes approximately 30-60 minutes, causing minimal tooth sensitivity. 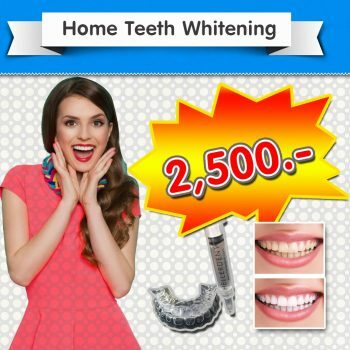 The Home whitening kit comes with 2 customized trays and a bleaching solution. First, the patient must come to the clinic to make the impression for the trays to fit perfectly to prevent whitening solution from spilling over into the gums, and then teeth whitening is done at home without the supervision of a dentist. The treatment starts by brushing teeth thoroughly, then squeeze the bleaching solution into the tray enough to cover all teeth, about a pea-size on each tooth, then wear the tray overnight. Treatment duration may take up to two weeks to see the whitening takes effect. If after 1 week, there is no noticeable change from teeth’s initial color, you may ask dentist to adjust the concentration of the substance. Pattaya Smile Dental Clinic is one of the leading private dental clinic in Pattaya specializing in cosmetic dentistry and smile makeover. Our well-trained team of dentists together with advanced techniques and cutting-edge technology guarantee a pleasant dental treatment experience. 111/57-8 Moo 10 South Pattaya Rd. Banglamung, Cholburi Thailand 20150. © 2017 Pattaya Smile Dental Clinic All rights reserved. | Pattaya Dental Clinic ☺ Your Smile , Our Passion!